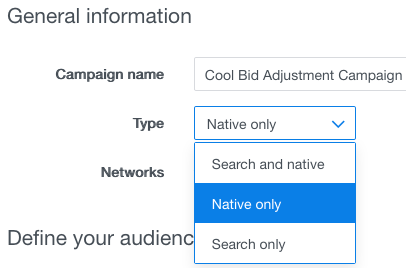 Native Bid Adjustments is a new advanced feature extension to the Oath Native & Search native family that provides you with greater control over your campaign performance. If you’re a brand or direct-response advertiser, you can now adjust bids to optimize supply and device placement toward your campaign objectives. You can download a sample Bid Modifier Calculator in .csv format here. Use native bid adjustments to maximize the efficiency of your campaigns by setting your price for Oath and third-party publisher supply and device placements. Modify positive and negative bid thresholds, enabling you to better control supply, as well as influence platform performance. Apply bid adjustments to all campaign objectives except oCPC and app install. Ideal for advertisers who want mobile and third-party supply – but need to pay the right price for that inventory. Bidding is via a positive or negative modifier. Group 1a Native ads on large format devices Served on Oath sites and apps as well as top-performing third-party publisher sites and apps. Group 1b Native ads on small format devices Served on Oath sites and apps as well as top-performing third-party publisher sites and apps. Group 2a Native ads on large format devices Served on third-party publisher sites and apps. 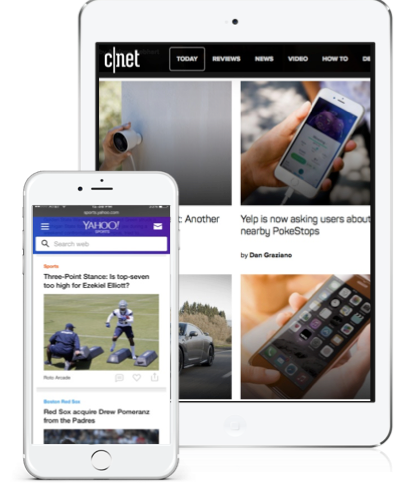 Group 2b Native ads on small format devices Served on third-party publisher sites and apps. Group 3a Native ads on large format devices Served on third-party publisher sites and apps. Group 3b Native ads on small format devices Served on third-party publisher sites and apps. All supply from Oath sites and apps is part of Group 1. Group 1 also includes Oath’s best performing third-party publisher supply. Groups 2-3 are composed of third-party publisher supply, and don’t include inventory from Oath sites and apps. Performance reporting is available with the Native Bid Adjustment report in the Native & Search UI. Click Manage ads > New campaign > (Campaign objective specified) > General information. In the General information panel, click Type > Native only. In Define your audience section, the list of Native network partners appears, sorted into 3 groups for Publishers with options to increase bid adjustments by percentage number. 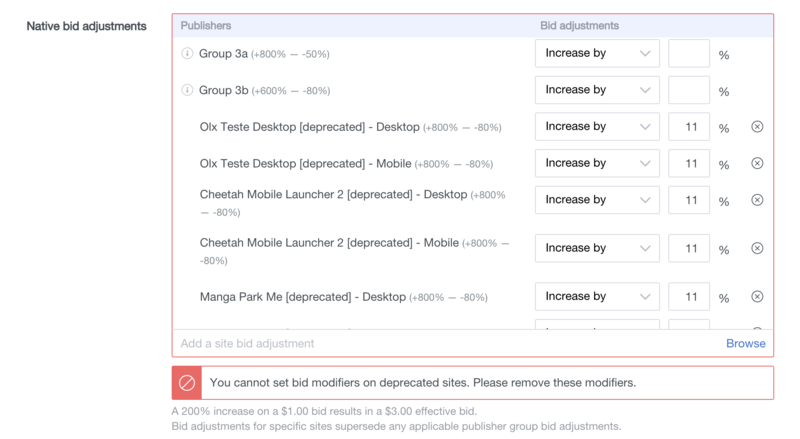 Once you’ve specified the increase or decrease of your bid modifier thresholds, click Save. To edit existing campaigns or ad groups, follow the same steps described above. For which campaign types is this new feature applicable? Where can I set the bid modifiers? Can I still run mobile-only campaigns? How often are these 3 groups refreshed? What is the effect of impression share on Group 1 when negative modifiers are in place on Groups 2 and 3? What percent of my ads will be served in Group 1, Group 2 and Group 3? Are tablet placements part of A or B modifiers? All campaign objectives, except oCPC, App Install and Promote my products. At the Campaign and Ad Group levels (On Native-Only Campaigns). Performance is analyzed daily and the groups are refreshed accordingly. Bid groups are independent of one another. A bid in one group does not affect impressions in the other groups. Native & Search is a dynamic marketplace. Other advertisers and other bids in the system at any given time will determine where, and how often, your ads are served. Tablet sections are grouped with B modifiers.